A day in the life of a Milwaukee County juror. 8:55 a.m. – I’ve made the walk from my bus stop on W. Wisconsin Ave. over to the south entrance of the Milwaukee County Courthouse. As a regular visitor to the political, not judicial, function of the courthouse, I’m well prepared to handle the airport-esque security you must endure to enter the building. 8:59 a.m. – I’ve rushed up the staircase to the building’s first floor and into the jury assembly area. The whole process would seem a lot more dignified if you could actually enter the building on the first floor; instead security practices force you down into the basement and through a metal detector before you can climb the stairs to the building’s great hall on the first floor. 9:00 a.m. – Wow, this place is packed. Unlike a county board meeting where you show up a minute or two late and seats are still easily available, jury assembly has packed over 100 people in a theater-style room. I find myself squished into a seat between a support column and a friendly gentleman with an overload of tattoos. 9:04 a.m. – The show has started. Milwaukee County jury services manager Lori Schumann tells us that circuit court judges Cynthia Davis and Michael Hanrahan and clerk of circuit court John Barrett will all appear to thank us for our service and educate us on the process. 9:13 a.m. – A video to motivate (and educate) us is played. 9:30 a.m. – Video over. Seventeen minutes is apparently all it takes to prepare you to be a juror. Surprisingly decent quality. The TVs are quite small though, probably a five percent chance anyone in the back of the room actually saw it. Fifty percent chance someone in the back couldn’t tell they changed the channel from Kelly Ripa explaining to us what she did last night on Live with Kelly to Wisconsin Supreme Court justice Shirley Abrahamson explaining to us the process of being a juror. 9:34 a.m. – John Barrett is here and he’s brought jokes. Turns out Tom Barrett wasn’t the funniest one in the family growing up. 9:40 a.m. – Barrett notes that former judge Charles Kahn (who happens to be the landlord of this publication’s office) had two jurors that met in his courtroom and ended up getting married. Who needs Match.com? 9:49 a.m. – I spy someone I know in the crowd. What are the odds in a county of just under one million people that a random sampling of 100 people would include someone I know? 9:51 a.m. – I have escaped the dark, theater room for an open room that has windows and tables. It’s of course packed, as we were instructed not to leave the jury assembly area (except during our roughly once a hour breaks), but there is certainly more space than the “theater” room. I’ve been here for less than a hour, but I’m totally on-board with building a new courthouse complex. It’s quite obvious that in order to fit the number of people needed into this building (which Frank Lloyd Wright once described as a “million dollar rockpile”) compromises have been made left and right. On the plus side, there are vending machines, bathrooms, a refrigerator, microwave, a few public computers and it feels clean. On the downside, you’re going to spend the day real close to a lot of strangers. 10:02 a.m. – John Barrett warned us the wi-fi would be slow. That would be an understatement. He noted that jurors are free to give ideas: my number one suggestion right now is faster internet access. I’m thankful I brought my laptop. We’re ten minutes in and some people already look bored and are attempting to sleep. 10:11 a.m. – I’m using every ounce of willpower to avoid eating my lunch before 10:30. It’s going to be a long day. 10:31 a.m. – Lunch time! I don’t feel guilty about eating, because lots of people came well prepared with food and almost no seems to want to talk. 10:33 a.m. – The first jurors are called. I didn’t make the randomly-selected list, so why not keep eating? 11:30 a.m. – We’re dismissed for lunch and given an absurdly long two-hour break. I’m off to catch a bus down Wisconsin Ave. to Urban Milwaukee HQ in East Town to snag a couple hours of work at my desk. I could just stay and keep working on my laptop, but the chance to escape the deadly quiet room packed with strangers is too alluring. I plan to take advantage of the free Milwaukee Public Museum access (with your juror sticker) during tomorrow’s lunch break. 1:05 p.m. – I snag a Bublr Bikes bicycle at the intersection of N. Water St. and E. Wisconsin Ave. to swing back to the courthouse. This jury duty thing doesn’t seem hard at all if I get to spend half the day at my office. 1:17 p.m. – I make my way through security. I’m getting really good at taking my belt off while walking down stairs (a skill I assume is required to be a good attorney in Milwaukee). 1:19 p.m. – I’m back in the jury pool assembly area. Lots of people here just staring off into space, which is mostly what they were doing when I left. How many of these people never left? Nope, doesn’t look like I missed any action. 1:23 p.m. – I can see 33 people from where I’m sitting. Not a single one of them has said a word since I’ve come back. 1:24 p.m. – Of the 33 people I can see (there are many more in other rooms, but the racial makeup seems consistent at a glance), three of them appear to be black. All females. If you’re a black male, you’ll have a really hard time getting a jury of your peers. 1:47 p.m. – We have to be here until 5 p.m.? That’s 193 minutes more. Hope someone rips a loud fart just so we can all have a laugh. 1:55 p.m. – For all the idle time we have here, and the number of people that seem to be thumbing magazines, it’s odd that no one has mentioned that the Milwaukee Public Library‘s Central Library is across the street. But we are informed of what movies are playing in the theater room. This strikes me as an obvious opportunity to encourage people to visit the gorgeous Central Library and utilize things their tax dollars buy. 1:59 p.m. – The wall clock made a bunch of noise in the countdown to 2:00 p.m. Finally a shared experience for everyone in the room. 2:05 p.m. – 35 jurors called. This place is emptying out. It’s still eerily quiet, save for the occasional bathroom goer hitting a chair while trying to navigate their way out of the maze. 2:14 p.m. – Another group of names called, including me. Say hello to juror number 30! 2:18 p.m. – Our group of 30 is escorted upstairs by a bailiff to the sixth floor courtroom of judge Pedro Colon. On the way into the courtroom I spy a defense attorney I know leading a client to meet with another judge. 2:30 p.m. to 3:30 p.m. – We’ve caught a criminal case. The voir dire process takes place so that the judge, the state’s attorney serving as the prosecutor and the defense attorney can get to know us. The 30 jurors also get to know each other in the process. Some are married and one of us is widowed. One has 10 kids and many of us have none. One served time for armed robbery and another works as manager of a grocery store that gets robbed a lot. One has a newborn and needs to use a breast pump regularly and another needs diabetic medication. Three of us identify as living on the Lower East Side and many come from the southwest suburbs. One is a scoring official for a golf tour and another is a pesky journalist trying to chronicle this. Only one of us, like the defendant, is black. After a lengthy period of questioning by both sides of the case, we’re escorted out of the room to two jury deliberation rooms. Immediately everyone pulls out their phone, yet it looks like everyone is following the judge’s instructions not to look up the details of the case. After waiting for a relatively short period, we’re ushered back into the courtroom via a back hallway. The whole suite of rooms looks far less glamorous than anything you would see in a TV show. Once we’re back in the courtroom, Judge Colon starts calling out juror numbers in order and asking them to stand. He doesn’t explicitly tell us, but we’re finding out who the 12 are. They make it to juror 22, at which point both parties certify this is the jury that was selected. Doesn’t look like they ever got far enough along in the count to consider if I was worthy of being on the jury. 3:40 p.m. – Those of us not selected make our way to the first floor jury assembly area. Taking me by surprise, no one starts discussing the case. 3:50 p.m. – Back in the main room, I briefly discuss what I missed with others sitting by me. Turns out the case called earlier in the day was for judge and likely sheriff candidate John Siefert‘s court. 4:29 p.m. – Back in the jury assembly area, we’re dismissed early for the day. Despite being scheduled for two days, we’re dismissed after one. We’re told we’ll be paid $25 for our service ($8 for each half of the day, plus $9 for transportation) and won’t be called again for a minimum of four years. We’re thanked for our service, given letters to show our employers and instructed to go to work tomorrow. So that was it. Pretty anti-climatic. I spent less than a hour in an actual courtroom, and only a handful of hours in the courthouse. I technically didn’t miss much work because I could bring a laptop with. Those that didn’t have laptops had magazines, smart phones and books. For anyone that can take a bus or bike to the courthouse, the process of getting there is painless. If you had to drive, there are plenty of parking garages in the area. The notion that jury duty is some great inconvenience seems laughable. Yes, being on an actual jury would take more time, but you’re guaranteed to be done by 5 p.m. every day and given regular breaks. If that’s the cost of democracy, it’s a small price to pay. I pulled an actual trial that lasted 3 days total. But the jury spent about 1/4 of it’s time in the jury room while the lawyers tried to cut a deal and another 1/4 in that dingy little hallway just outside the courtroom while waiting for them to be ready for us even though they summoned us. The second day they must have marched us in and out of the court room 4 times besides the lunch break. And the jury room was a dismal dirty affair with rodent traps and a box of stale donuts on one of the tables which proved to be glued to the table by age when we disgustedly decided to get rid of it. And most of the chairs were in an awful state. But we were in the Safety Building not the Courthouse. 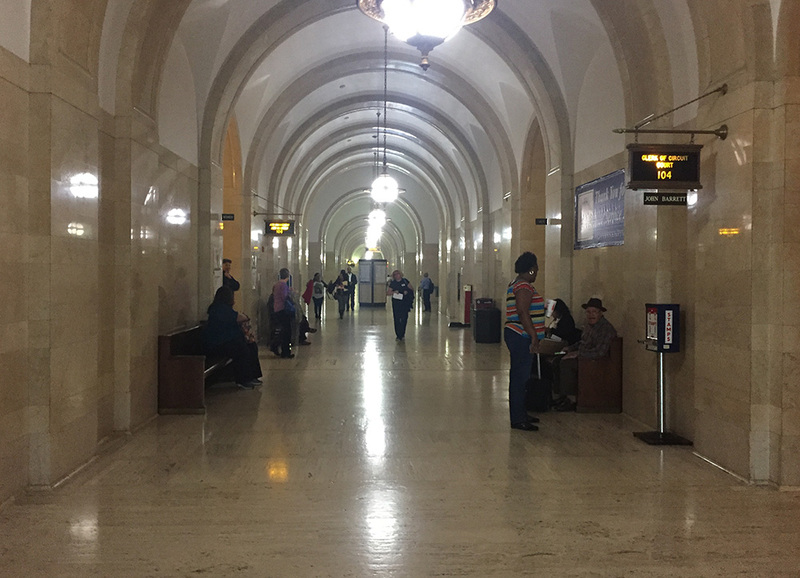 Too bad you didn’t try the Courthouse cafeteria instead of heading back to the office…another dreary quiet place for jurors while everyone else avoids you and the employees and lawyers noisily enjoy their lunches. I had jury duty too. 7 day trial. The judge would have us say an oath that I swear or affirm to do my duty, so help me God. Being an athiest I did not like the so help me God part. I was happy with swearing or affirming. Frankly the so help me God part seemed liked a qualifier, as I do not believe in Him, there would be no moral reprecussions for not doing my duty. They could have said so help me Allah or Elm tree and it’s the same. No need for the God qualifier. I once was a witness in North Carolina and they had me swear upon a bible. Again I did it but it could have been a cookbook for all I care. People should just swear or affirm. The hardships of being an atheist. I can’t touch American money with that religious propaganda on it. I did not raise an issue so to remain a polite and decent human. Affirming to a God seems presumptuous and unnecessary. In regards to using a Bible I asked my orthodox Jewish friend what she would do. She stated she would request an old testament. I believe requesting that or requesting a Koran or whatever the Hindus use could prejudice the judge or jury. Anyways I handled it. In regards to the courthouse the picture shows a Ford foundation gum machine. It contains excellent quality chicklet like gum. Really good. Jason no one here expects you to understand or care what it’s like to be anything but a bitter, narrow-minded, old white guy. PMD what I find funny is atheists are like vegans. Like you PMD, “Reader” has to let folks know he is an atheist an then share his experience as a victim in a cruel world. I rarely walk into people that share with me they are Christian, Jewish or Muslim but you can always spot out the atheist cause they let you know pretty much after five minutes of conversation that they are atheist. Now that I think of it you can throw people that went to an Ivy league school into the mix. Similarly, vegans have to let you know they exist as vegans and what they are eating or were eating and if it was bought local..
You don’t get out much Jason. Or you are lying. Either is possible. I have extended family that are Christian and never let anyone forget it. They mix politics and religion at family events on a regular basis. Every birthday party or holiday gathering. I smile and nod because I am polite and civil. You should try it. On vegans we agree though. The ones I’ve met are very self-righteous. Just like the Christians I know. Don’t worry they’ll tell you. In regards to atheism. I don’t mention it. It can offend people or make you a pariah. I feel when taking an oath in a civil setting one should not have to qualify said oath to a belief in a deity. My word or my oath is my honor. Also that gum machine is great. Reader, you made it seem like putting your hand on a bible was a hardship. Where is all this intolerance? Bernie Sanders could have been President if he went third party and he stated recently, “I am not actively involved with organized religion.” I think being a Jew in the 1960’s and being told we hit are Jew quota for Medical school at Marquette University is a hardship. Being black in the 1960’s and being told by the United Auto workers that there is no employment for you based on your race is a hardship. What you described as a hardship is similar to being stuck on an elevator for five minute. Last I looked 25 percent of our country is atheist or agnostic, so tell the judge I don’t recognize the bible. No hardship. I’m an agreeable fellow so I went along. I just think qualifying an oath to a belief in a deity is not necessary and it is presumptuous. The US Constitution presidential oath does not include one. George Washington (the best) added so help me god and other presidents followed suit through their own volition. I also noticed no one has commented on the excellent gum machine. I think I’ll load up on quarters and grab a bunch. Cross my heart and hope to die!! !